In an interconnected and fiercely-paced world with digital disruption taking place across all industry sectors, it is of paramount importance that organizations re-visit their business models. Enabled by new digital capabilities, we are witnessing a shift from business as a zero-sum game to business as networked partnerships. These partnerships require organizations to strengthen their core value chain (e.g. suppliers, distributors and customers), while at the same time expanding their reach and engagement by collaborating with inter-and intra-industry partners. Changing an organization’s structure to embrace collaboration and partnerships can be difficult, as most organizations operate in a challenging duality: on one hand dependent on others’ success to gain success themselves; on the other hand, required to outperform those same organizations to acquire differentiation, market value and a sustained competitive position. However, with a focus on sustained growth and innovation, collaboration and partnerships is increasingly the way forward. A report by the World Economic Forum highlights that significant value can be created when a young business and an incumbent organization work together to share resources and collaborate on innovative ideas. Klaus Schwab, founder and executive chairman of the World Economic Forum highlights the importance of collaborative and flexible structures that reflect the integration of various ecosystems and which take fully into account all stakeholders. To help organizations operate in this dynamic and evolving environment with unprecedented speed of change and digital disruption, we propose a 3-step strategic approach. We call this the ‘ICE’ Framework. The fundamental beliefs underpinning this framework are that organizations must extend their reach and intensify engagement with internal and external partners. This can be achieved at three stages. At each stage, we propose a particular leadership role, a strategic push and an engagement focus. 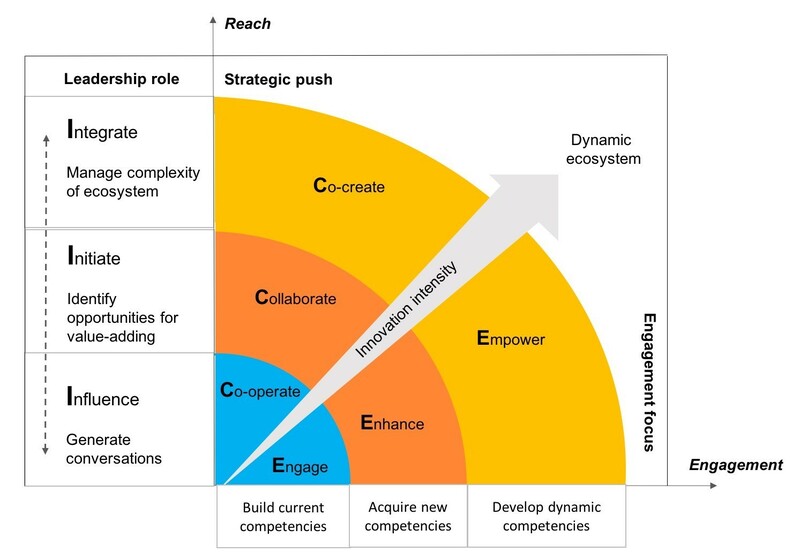 The thinking behind the framework is that organizations can enhance their innovation capabilities by first evaluating and building on their existing competencies, secondly acquiring new competencies through collaboration, and thirdly co-creating dynamic eco-systems with mutually empowered partners. Below, we explain each stage in further detail. In Stage I, organizations should look to build current competencies by generating conversations and knowledge-sharing internally and with immediate partners. The strategic push is to encourage greater co-operation between individuals and cross functional teams. The role of the leader at this first stage is to create a co-operative environment by being more of an influencer than a commander and controller. This is achieved through encouraging open conversations within the organization and influencing those who lead those conversations to create innovation hubs. Stage I can be achieved through the use of open innovation platforms, innovation competitions, creative hubs and digital conversational tools. Examples of internal innovation platforms include Google’s Moonshot Factory, Thomson Reuter’s Catalyst Fund and P&G’s Connect + Develop. More and more organizations are also opening up conversations among their non-traditional teams with tools such as Skype for Business, Yammer, Slack and Facebook at Work. This extended co-operation, reach and engagement can support organizations to create a culture of innovation. In Stage II, organizations should build on the internal conversations and co-operation created at Stage I and extend their reach to collaborate with external partners. This can pave the way to acquire new competencies and identify opportunities for value-adding. The strategic push is to form new collaborative partnerships and gain access to resources and capabilities faster and more efficiently. These collaborations can be up-stream and down-stream. The leader’s role here is that of a proactive initiator, analyzing, evaluating and negotiating new opportunities that add value to the collaborating partners. Collaborations in Stage II can be within and across industries. Often, collaborations are initiated to enhance competitiveness and build existing competencies. This is seen in how Ford Motor Company is responding to the disruption in the automobile industry. Ford has set up a Research & Innovation Center in Silicon Valley and has teamed up with Stanford University and MIT to advance automated driving research. We also see similar collaborations taking place between Emirates Airline and Oxford University with the launch of the new Data Science Lab. This Data Science Lab will use cutting-edge analysis to enhance the airline’s services to attain greater efficiencies and customer-focus. Collaboration is also taking place between born digital businesses such as Uber and Hilton, which benefits both companies and their customers facilitating and extending better customer experiences. In addition to setting ‘Ride Reminders’ to and from the hotel, Hilton HHonors members can also access recommended restaurants and other hot spots based on the places most visited by other Uber riders. This is a mutually beneficial partnership that gives Hilton customers unique benefits and extends Uber and Hilton’s reach and engagement. In Stage III, we propose an approach of co-creation between multiple and heterogeneous organizations and partners. These all work within a dynamic eco-system. Here we see organizations joining a rapidly changing environment which requires hyper-agility in order to benefit from new and emergent opportunities. Stage III builds further on the core competencies built in Stage I and the experience of collaborating with external partners in Stage II. Therefore, at this stage, organizations will be equipped to work with multiple partners to create change across industries. The leadership role at this stage is to be an integrator with a strategic focus on evaluating risks, investment needs and organizational positioning within that co-created eco-system. This is a complete transformation of the traditional leadership approach of commander and control. An example of a dynamic eco-system is General Electric’s Ecomagination program. The goal is to create a network effect and inspire more companies to work together to solve the world’s big environmental challenges. GE partners with Total, Intel, Walmart, Goldman Sachs and Masdar to develop new, sustainable solutions to the most urgent water and energy problems. We also see diverse organizations such as ABB, Omega, Schindler, Google and Solvay coming together to co-create the world’s first solar powered aircraft, which may revolutionize travel and mobility at an unimaginable scale. The ICE framework can be utilized by organizations to extend their reach and engagement through internal co-operation, by collaborating with external partners and through the co-creation of dynamic eco-systems. Applying these strategic stages can support organizations to move from a disrupted to a more connected and collaborative digital environment that we now all live and work in.